A third artist leaves the Infinite Art Tournament. Now, on the... your style of painting, it's been said, as drips are to Jackson Pollock and spots to Seurat, so gashes of thick paint are to Auerbach. I mean, just as a straightforward description, does that... does that mean anything to you? I'm not so much aware of it. I don't think Seurat would have been aware of the dots - he would have been aware of what he was trying to do, the dots were an instrument. I don't think Pollock would have been aware of the drips, because sometimes there weren't drips after all - some impressive paintings were done with the brush, and Seurat's first painting of the Bathers that we've got in the National Gallery is as grand as a Massacio in its discovery of three-dimensional sculptural form. And I... I don't think I'm going to do a thick painting, on the other hand it's... it's a by-product and I can't... I don't disavow it and I'm not ashamed of it and nor am I interested in other people's thick paintings - it's not the essence of the matter. Yes, it's a technique to achieve the essence of what you're doing. The technique, the expression of gashes, vectors and so on is incidental to the search for meaning. They're like Giacometti, particularly the earlier ones, aren't they? The early ones are, yes. I mean, it wasn't that when I saw this happening I stopped it. I was... I was delighted... well I wasn't delighted, but I was quite prepared to accept something that looked outré and strange but that wasn't the first thing I wanted to do. The first thing I wanted to do was to state the truth, and the point about the truth is, the truth is not a painting. The truth is something that hasn't been captured by painting yet. As soon as you do something that looks like a painting there are all sorts of ways of making it work that precisely because it's already been done, are presented to you. But you've got to venture into unknown territory where you're trying to state the thing, without having these hand-holds and grips and assistance of previous practise and so when the paintings became these strange lumps of thick paint, I was very interested and I pursued that line. That implies that there was an important quality of discovery between yourself and the painting, you didn't set out to say, I'm now going to paint something a few inches thick. It happened that way. Absolutely, absolutely - that's precisely what happened. 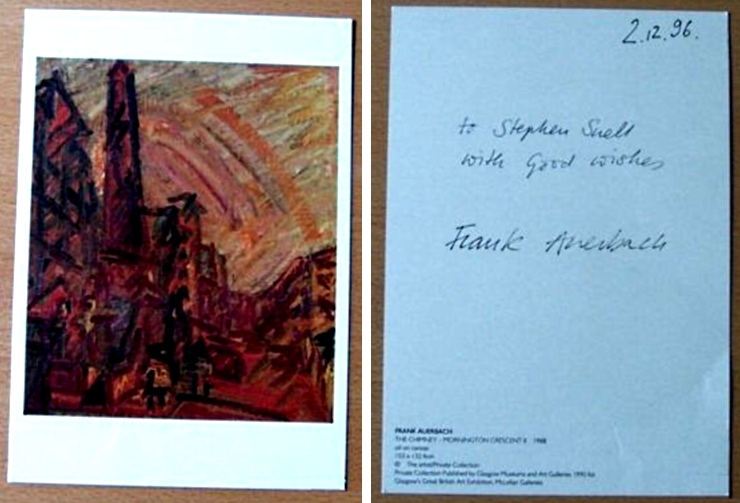 -- Frank Auerbach interviewed by John Tusa on BBC Radio 3. Full Transcript and recording at http://www.bbc.co.uk/radio3/johntusainterview/auerbach_transcript.shtml.